The combination of orange and pistachios intrigued me and so I tried them out for the kids. I also was wondering about the usage/relevance of sooji/semolina in these cupcakes. Any thoughts on those are definitely appreciated. The kids are happy as long as they are cupcakes and they taste good. The kids had a blast decorating them as well. For Day 3 Week 4 of BM #28, here are the cupcakes.. I always prefer baking cookies when the kids are home with their friends on play dates. One reason is I get to engage them in an activity for sometime specially when they get all cranky and hyper after a while! The other reason is that the kids get a chance to showcase their creativity, have fun and eat them too! On one such occasion, I baked these healthy cookies and handed them the decorating supplies and it was very cute how they were trying to outdo the other in adding the sprinkles and the frosting!! Check out what the kids decorated and enjoyed them for Day 2 Week 4 of BM #28. Sift the flours and baking soda. Mix in salt and rolled oats and set aside. Add the chocolate chips as well. Whisk the butter and powdered sugar until the sugar dissolves. Mix in the milk and lemon juice. Add the liquid ingredients into the flour-oat mixture and gently mix to make a stiff dough. Preheat the oven to 375 F. Line a couple of baking trays with parchment paper. Pinch a tablespoon of dough (or more as per preference), flatten into a disc and place on the baking tray. After all the dough is shaped into cookies and arranged on the trays, place the baking trays in the oven to bake for 20-22 min or until the undersides are slightly brown. Remove and let them cool on the wire racks. Enjoy as is or let the kids decorate and have fun! Check out the Blogging Marathon page for the other Blogging Marathoners doing BM#28. Passing on these Cookies to Srivalli's Kid Delight hosted at Nivedanam. Anyway I made these for them as an after school snack and they munched them with their share of milk without any complaints. Check these out for Day 1 week 4 of BM #28. Here is the third kootu in this series. Typically any winter greens can be used for this type of kootu and I happened to make this with spinach. In fact any vegetable or a combination of vegetables can be used with this kootu masala, only it wouldn't be keerai kootu, right? As I understand Keerai means greens. Here are the Kootu recipes I blogged in this edition of BM #28. Here is another version of kootu which we enjoy at home. This is a very simple kootu where there is no roasting of dals/spices is involved. We love it for its simplicity. If you love the taste of poppy seeds, then it is a must try!! For Day 2 week 3 of BM #28, check it out. Kootu in Tamil, according to Wiki, is a dish made with vegetables and lentils in a semi liquid form. Such a simple explanation for such an elegant form of food! I shall blog three such Kootu recipes which we enjoy at home as part of BM #28. Poricha Kootu, as I understand, is when urad dal and pepper are freshly ground to flavor the kootu. So whatever vegetable you use with this combination of masala, it qualifies as poricha kootu. Please correct me if I am wrong, though. For this month's Indian Cooking Challenge, Valli has taken us to the shores of Mangalore and Goa. These yeasted cakes are supposed to be part of the traditional Christmas fare in that area. These fluffy idlis (as I like to call them) were a true delight to have. For the adult version, I sprinkled some crushed red peppers while the kids version had a small dose of sugar. I was skeptical about adding too much of yeast and so reduced it to 3/4 tsp and there was not a trace of the yeasty smell during the steaming or after. Soak urad dal and the rice separately for at least 3 hours in plenty of water. Both of the varieties of rice can be combined. Drain the water and grind the urad dal first to a fine paste adding as little water as possible. Then grind the rice also to a fine consistency. The resultant batter should be of dosa batter consistency. Meanwhile soak yeast in warm water along with a little sugar and let it froth up. Add this yeast solution to the batter and set aside in a warm place for fermentation. It should double in a couple of hours. Prepare a few ramekins/cups (steel or aluminium) by greasing them. Without mixing the fermented batter, pour into the greased ramekins until they are half full leaving some space for the batter to rise. I made 8 ramekin size, a 6 inch cake and a 7 inch cake. Steam the ramekins for about 15 min. Unmould and enjoy with any accompaniment of your choice. We enjoyed it with peanut chutney while the kids dipped them in Badam Milk! 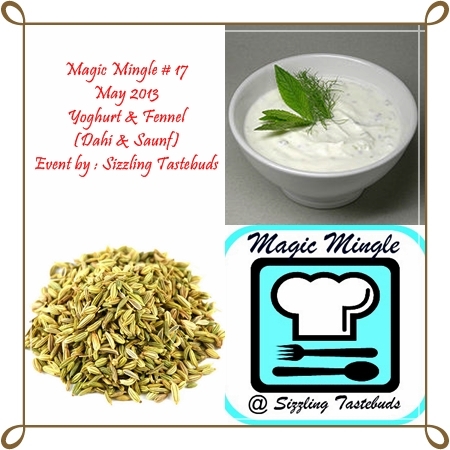 This month's Magic Mingle called for the ingredients of Yogurt and Fennel. I was set on making a soup using fennel but was still undecided on what vegetables should go in. I finally decided that I would use apple and carrot as the base and tried it out. My husband who usually doesn't like carrots, loved the fennel flavor and smell so much that he gobbled up the soup heaping compliments :). He said it reminded him of some soup he had in a restaurant in India! *Feel free to use crushed fennel if preferred or A fresh fennel bulb would be aromatic as well. Boil the chopped carrots and apple until tender. Blend until smooth adding about 1 cup of water or vegetable broth. Pour the pureed carrot-apple mixture into the pan, sprinkle salt, curry powder and pepper to taste and simmer for about 3-4 min. Remove from fire and mix in the beaten yogurt and serve it warm with croutons. 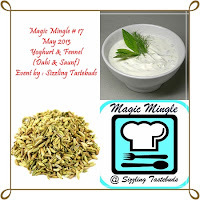 Linking this soup to Kalyani's Magic Mingle .. When we are talking about samosas, how can anyone forget the typical Punjabi samosas? I couldn't not prepare these samosas with the inimitable taste of coriander seeds and pomegranate seeds in almost every bite ! I stress that for those of you who are like me, who can tolerate the baked versions, go for it. Just spray some oil and bake them at 375 F for about 25 min or until they are golden brown all over. Here are the Samosas I prepared for this edition of BM #28..
Also another one from the archives ..
Roast and coarsely crush the coriander seeds and dried pomegranate seeds. Set aside. In a heated pan, add oil and cumin seeds. After the cumin seeds crackle, add the boiled and mashed potato, turmeric and boiled peas. Add salt, red chilli powder, amchur powder, garam masala, coarsely crushed coriander seeds and dried pomegranate seeds. Mix well until the flavors are uniformly blended. Remove from fire and let it cool. Pinch a big marble sized dough and roll it into a thin circle (like roti). Using a pizza cutter or knife, cut the circle into 2 halves. On each half, apply water to the edge and make a cone/triangle shape and press well so that the edges are sealed properly. Fill in about a tablespoon of the filling and seal the edges by applying water. Keep them covered while the oil is heated in a kadai/wok. Gently slide these in moderately hot oil and fry them in low-medium heat. Drain them on to kitchen paper towels when they get a golden brown hue. Continue frying them in batches and serve them hot with chutney of your choice. For Day 2 Week 2 of BM #28, here is another filling for our favorite samosas. Personally these samosas have become my favorite. All of us agree that Samosas make for great appetizers at parties, right? So when Srivalli announced 'Types of Samosas' as one of the themes for BM #28, I thought I would take it up to please my family :). For the wrapper, I have earlier used a different ingredient mix for Vegetable Samosa. I have observed that both the wrappers work well. Since my older one loves the scrambled tofu, I thought I should try this in a samosa form and see if she likes it! She really did like it. I also baked a batch of samosas instead of frying in the oil for my humble self :). Here is yet another delightful vegetable-lentil medley which has already become a family favorite. This is supposed to be a traditional Sindhi Variety which we have since adopted :). There are so many Sindhi Dishes which I have bookmarked and made some too. I am sure I will get another opportunity to post those ! So check it out for Day 3 Week 1 of BM #28. As soon as I saw this recipe in SindhiRasoi, I felt it was closer to our pulusu variety where we add tamarind along with vegetables. My husband who is a major fan of garlic was very happy with the garlic smell wafting through the kitchen! So for Day 2 Week 1 of BM #28, here it is..
We start yet another edition of Blogging Marathon. For the first week of this edition, I have chosen to blog some traditional Sindhi dishes. I have browsed through some websites which had some authentic Sindhi dishes listed and I picked out three simple ones to make which I shall feature for the next three days. The first one is of course, this Tidaali Dal or Tridaali Dal which, as the name signifies, is made out of three lentils. I have seen various ratios of these dals in multiple websites and I chose to go with a ratio I am comfortable with. We found this to be a very aromatic dal and comforting at best! Wash the dals and pressure cook them along with ginger and green chillies until they are thoroughly cooked. Mash the mixture, add in salt and turmeric. In a pan, add oil and the rest of the ingredients. After the mustard seeds crackle, add the grated garlic and saute until it turns golden brown. Add the mashed dal and let it simmer for a couple minutes and remove from fire. Traditionally it is served with Sorghum Roti but we enjoyed with Rice. Also I squeezed in some lime juice to suit our palate.